Welcome to the Fujifilm Digital Camera Giveaway! Thrifty 4nsic Gal is Excited to be sharing this awesome giveaway. Readers usually go nuts for this one. This camera features a 14MP CMOS sensor that can shoot at up to 10fps, mounted behind a 5x, 28-140mm equivalent zoom lens. It is shockproof to 2m, waterproof to 10m, freezeproof down to -10 degrees Celsius and dustproof. 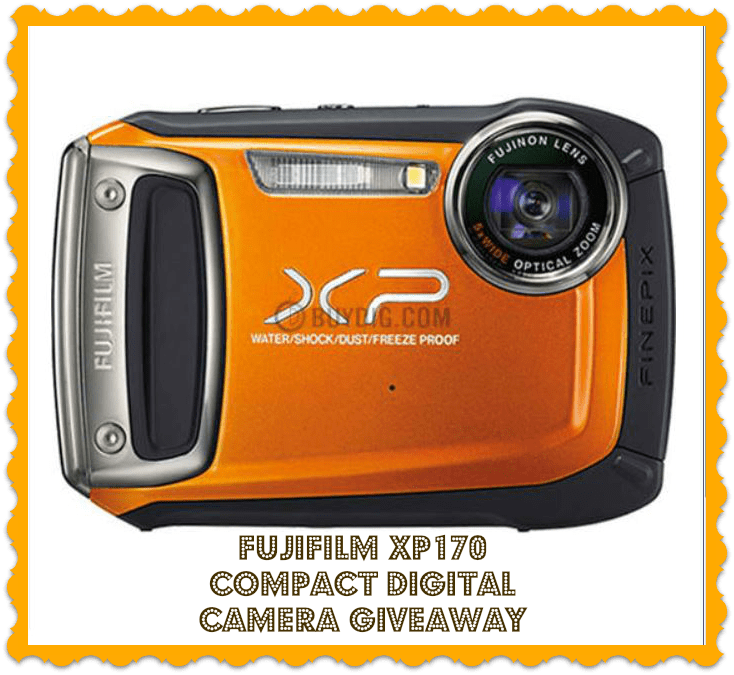 With the FinePix XP170, fast image upload to social networking sites no longer means low quality pictures. You can share the experience with easy image transfer to SNS! The camera can be connected with any Android smartphone/tablet or iPhone/iPad via the simple download of the “FUJIFILM Photo Receiver” free app to their device, which includes easy to follow instructions to get them quickly connected. Giveaway Date: Dec. 3 – 17, OPEN to US residents only. Disclosure: Thrifty 4nsic Gal is not responsible for sponsor prize shipment. Buydig.com is responsible for shipment of the prize . This event was organized by Happy Home and Family. Contact Jade at [email protected] with questions or if you want to be featured on our the next Giveaway event! Nikon D3200 24.2MP DSLR Camera Kit with 18-55mm VR and 55-200mm DX Lenses. I like the Hewlitt Packard Printer. is the one thing (but not the only thing) that I would love to have. Oh what a treat it would be in my bedroom since I’m handicapped and spend a lot of time in bed. I would like to own the Sony NEX7K/B – NEX-7 24.3 MP Black Camera w/ 18-55mm & 55-210mm lens 32GB Bundle! It’s on my wishlist! I would also love to own the 15.6″ N550JV-DB71 Full HD Multimedia Notebook PC – Intel Core i7-4700MQ Proc. The Canon Mini Compact Camcorder looks awfully nice!! i would like to have the Hamilton Beach 40911 2-Quart Electric Iced Tea Maker. Digital Camera Body -WITH ADOBE ELEMENTS! Now that’s a dream camera! Thanks! I would like to have Canon Powershot G15 12 MP High-Performance Digital Camera! I would also love to have this LG 55LS4600 55″ 1080p 120Hz LED LCD HDTV!! It would be awesome to have this Toshiba Satellite U845W-S4180 14.4In Ultrabook (Midnight Silver) – Intel Core i7-3537U!! I want the Nikon D800, or the Nickon d7100 or a Sigma 10-20mm lens for my Nikon! I have expensive taste!! I would also love to own the Samsung UN55F6400 55 Inch 1080p 120HZ 3D Smart Wifi LED HDTV!!! It is soooooo nice!!! I would love to have this Dell XPS 2720 Desktop PC w/ 27″ QHD Touch Monitor Intel Core i5-4430S – XPSo27-715BLK! I would love to own this Asus ZENBOOK Prime 15.0″ UX51VZ-XB71 Ultrabook PC – Intel Core i7-3632QM Processor! It would be amazing to own this LG 84″ 4K Cinema 3D Smart LED TV Ultra High Definition (84LM9600)! I would like to have the Hewlett Packard SlateBook. I would love to have this Cuisinart SM-70BK 7-Quart 12-Speed Stand Mixer, Black ! Able Planet Around-the-Ear Active Noise Canceling Headphones are a screaming deal! Over $100 off original retail price…only $39.95! D800 36.3 MP CMOS FX-Format Digital SLR Camera is on my wishlist!! I would love to have this Asus 17.3″ G750JH-DB71 Full HD Gaming Notebook PC – Intel Core i7-4700MQ Processor!! I would like to have the Krups Espresseria Full Automatic Espresso Machine with Built-in Conical Burr Grinder! I would love to have this LG 47LM6700 47″ Class Cinema 3D 1080p 120Hz LED Plus Local Dimming TV with SmartTV! My son would love to have this Nikon COOLPIX L28 20.1 MP 5x Zoom Digital Camera – Red ! Samsung digital camera- on the husband’s wishlist from Santa!